A very simple, fun craft involving hearts, a little scissor work and creative coloring/drawing is on tap today. It’s a bright, sunny day here, and these Valentine’s Day Sun Catchers are the perfect thing to catch the sun as it streams in the windows! 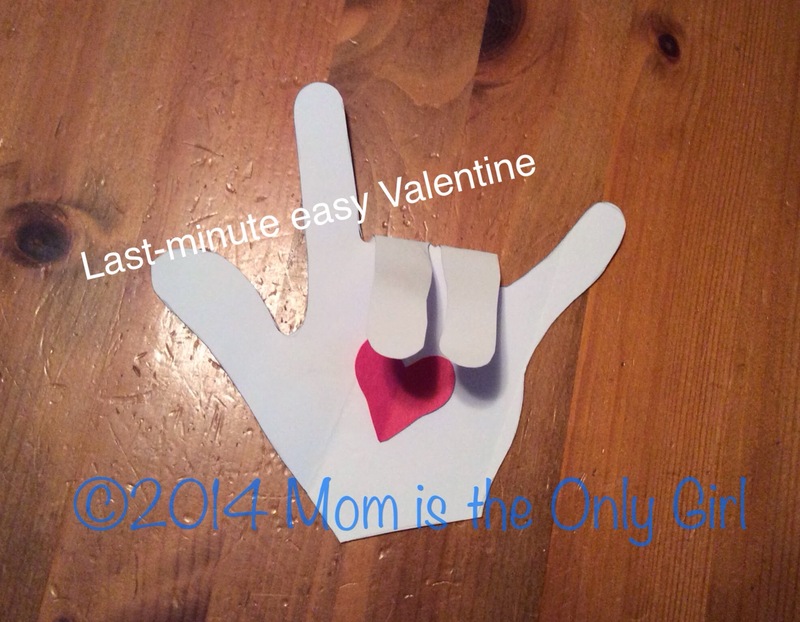 Simply draw a heart (or any other shape) on the paper and get creative with coloring it. 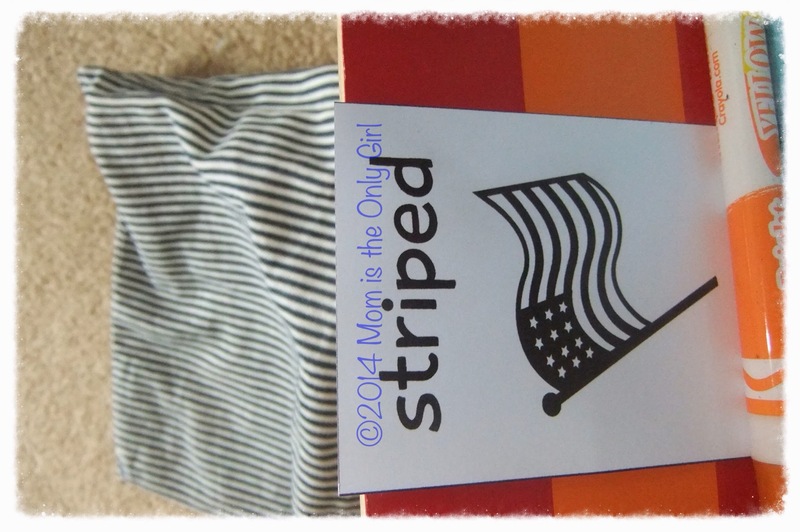 Cut it out, making sure to hole punch where you’ll hang it from. Lay out some paper towels over wax paper and place your creation on the towels. Place some oil in a small bowl on your prepared surface close to your project. Take your cotton ball, dip it in the oil, and generously spread the oil over the top of your creation. Turn your project over and spread the oil over this side as well. You’ll know when you have enough on when it appears sort of translucent. Place a fresh paper towel over one side and pat it dry. Repeat on the other side. Of course, your creation won’t be completely dry. At this point set it aside on clean paper towels for a few hours to dry some more. Once it is dry, lace a pretty yarn, ribbon or even rope through the holes and hang it in front of a sunny window! It goes without saying that this could be a messy project that should be done with adult supervision. Working on the coordination skill of cutting with scissors and working with an oily substance can be messy and dangerous. That said, it is a great activity for fine motor skills – coordination through coloring, cutting, pincer grasp for holding the cotton ball; science of working with colors. You could even make several hearts and number them turning it into a counting game! If you take a few moments and prepare your work surface, clean up will go much more quickly and smoothly. I have a friend who pulls out a cheap shower curtain, covers her table, and then places an old tablecloth over that when doing projects like this. I don’t know about where you are, but in my area it is sooooo cold! Cold enough for people to be doing those experiments you hear about every winter like throwing boiling water outdoors and it turning into snow. It’s also a dreary time. Everything seems grayish white unless there is fresh snow in the air or it is bright and sunny, but too cold to go outside. Today is, thankfully, one of the sunny days, however, it is below zero! First, get out some tins, cupcake tins, empty yogurt containers, anything you’d like to use as a mold for your ornaments. (Any size will do as long as it isn’t too big to fit flat in your freezer and hang by a string/rope from something!) Outside one house a couple of years ago I saw large ice wreaths with cranberries inside, made from an angel cake mold. It was beautifully big! In our home, we try to celebrate Jesus' birth and our love for each other. We incorporate going to church and giving gifts to loved ones, decorating a Christmas tree with items representing us and our memories. In other homes there may be no gifts, no tree, or no going to church. There may be no celebrating Christmas with a focal point being Jesus' birth. As I sit writing this it is 20 degrees outside with a light wind that makes it feel -50! 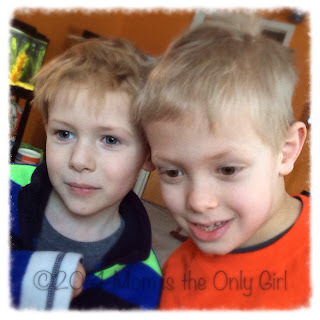 It seems like a good day to post a variety of ways I keep my boys active when it’s too cold outside to get that gross motor play in just by playing in the snow (or green grass as we currently have). Following are just a few of the ideas I turn to. I need a few more in my arsenal now that my almost-eight year old is getting bigger. Any ideas? 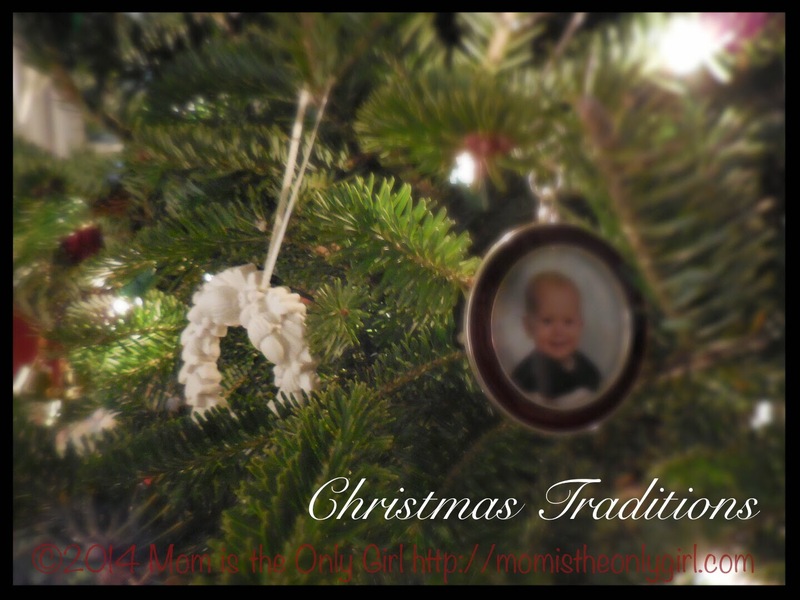 Have you been enjoying this week of simple homemade Christmas ornaments you and your child can make together? This last one I’m sharing seems like it should be for older children, but I think with supervision and help preschoolers would enjoy getting involved, too! I’ve provided an affiliate link for the ornaments for you below. These came out so beautifully that we are making some for our own tree this year! I bought the ornaments from JoAnn Crafts this year, but you can also find them on Amazon by following this (affiliate) link. I’m going to warn you making these can be addicting! It’s strangely relaxing, so you might even want to make these by yourself! Using a grater or whatever method you find easiest to make your crayons into small pieces, crush them up! It’s up to you if you’d like to group the shavings by color, but we found that to have the best results. As you remove the ornaments from the packaging try not to ruin the plastic package, as this makes a neat, safe place for the ornaments to cool off. Carefully take the top hook portion off the ornament by squeezing the round loop and pulling gently. Remember, these are made of glass. They are pretty sturdy, but can still break if squeezed too hard. (If it helps to know, we didn’t break any!) Set the loop aside for now. Get those little crayon shavings in there! Decide what color(s) you’d like your ornament to be, use your imagination, and place a few crumbs of crayon in your ornament. Experiment with color – its a great activity to review colors and introduce shades of colors and color creating to younger onese. Get the science lingo going if you’d like to make this into a mini science lesson! Then carefully put the hook back into the ornament. Clip the clothespin to the round hook and hold tightly as shown above. 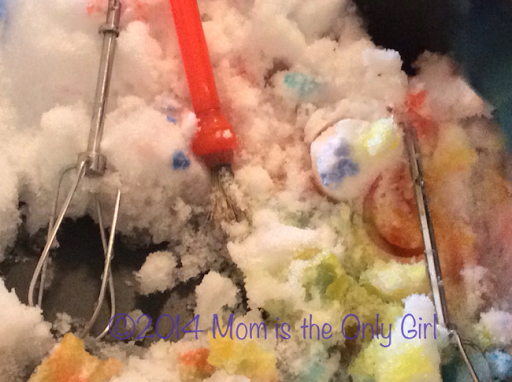 Use your hair dryer or heat gun to melt the crayon. I suppose you could also hold your ornament over a stove burner as well, but be very careful with whatever method you use. We used the clothespin to help keep our hands away from the heat. Keep turning the ornament and heat source until the desired swirling effect is achieved. Let the melted crayon ornament cool! Get creative with your color combinations and pattern attempts! 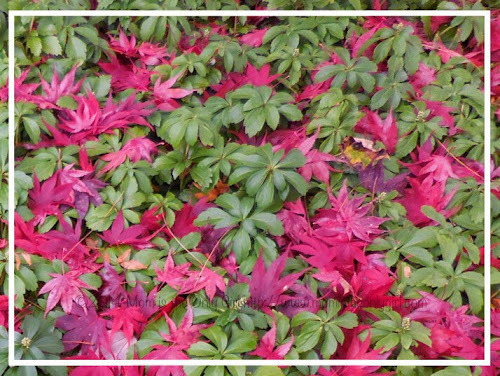 Even one swirl of a bold or shimmering color has wonderfully beautiful results! For some ornaments, we heated until just starting to melt and it created a spotty effect! I wish I had taken pictures of all the ornaments, or at least of a couple on a tree! I loved every creation for a different reason. You’ll know what I mean when you make your own! Once the ornaments are cooled package them in a pretty container and wish the recipient a very Merry Christmas! If you try this with your kiddos let me know what you think! And if you missed any of the previous kid-friendly ornaments I shared, feel free to check out the star ornament or the cutout ornament! Thank you for letting me share these homemade ornaments with you! Go spend some time with your kiddos and create something beautiful! Continuing with the idea of homemade Christmas ornaments, here are some baked dough ornaments we made and adorned to use as gifts. Anyway, after cutting out your shapes, lay them as directed on a cookie sheet. 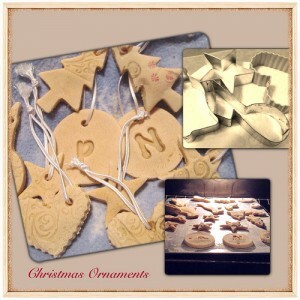 Before popping them in the oven to bake, let the kiddos pick out a few stamps to adorn the ornaments. Make sure they don’t press too hard, just enough to leave a clear indentation. Another option is to roll out the dough, then stamp all over the dough if you are working only with patterned stamps. And then make your cut-outs. We used a paisley-patterned roller stamp, swirls, initials…we even tried stamping in ink then onto the dough, but I think painting the ornaments afterwards would have worked better for us as the ink didn’t stick too well, although you can see some of the pink showing up. We packaged these with the more traditional cinnamon dough ornaments and our melted crayon ornaments to make special gifts for grandparents! Every year we try a craft for Christmas. 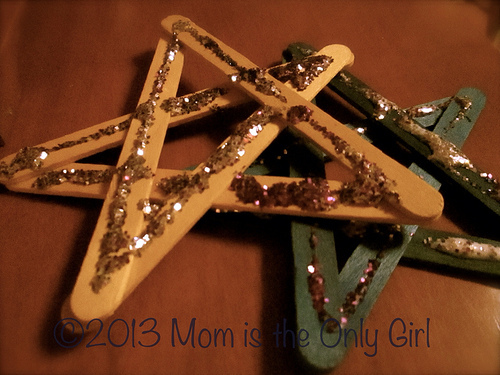 Last year we made stars and some other ornaments that we gave as gifts. 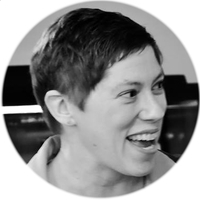 The stars are so simple to make and work on coordination skills and process thinking – some sneaky learning! liquid glue (we found it to work best adhering the sticks together, but try glue sticks on the surface of the craft sticks for the glitter!) You can also use glitter glue for decorating! First, lay out some paper on your craft surface, maybe have a paper plate nearby for catching glitter. Next, lay out your sticks in a star shape. You’ll get to sit back for a minute watching your kiddos think through how to lay them out overlapping to make the shape. It’s a bit tricky, so its fun to watch the thought process and coordination skills! When it’s achieved, grab some more sticks and make another, this time being prepared with glue to adhere the sticks together, using the first star as a model. Letting these dry as you make more and enjoy a snack is advised because the liquid glue take a while to set up. Third, take your glue in whatever form and apply it to the craft sticks in whatever pattern you’d like. It’s fun to try different color sticks or even use markers and create a pattern on the sticks before (or instead of) applying lots of glitter! We found it easiest to have several plates nearby to catch the glitter as it was applied, to save on glitter (one plate per glitter type) and to help eliminate some of the mess. Of course, if you use glitter glue then you can skip this step! The boys are already asking what we are going to make this year! 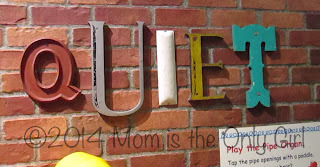 Are you making anything with your child for Christmas? 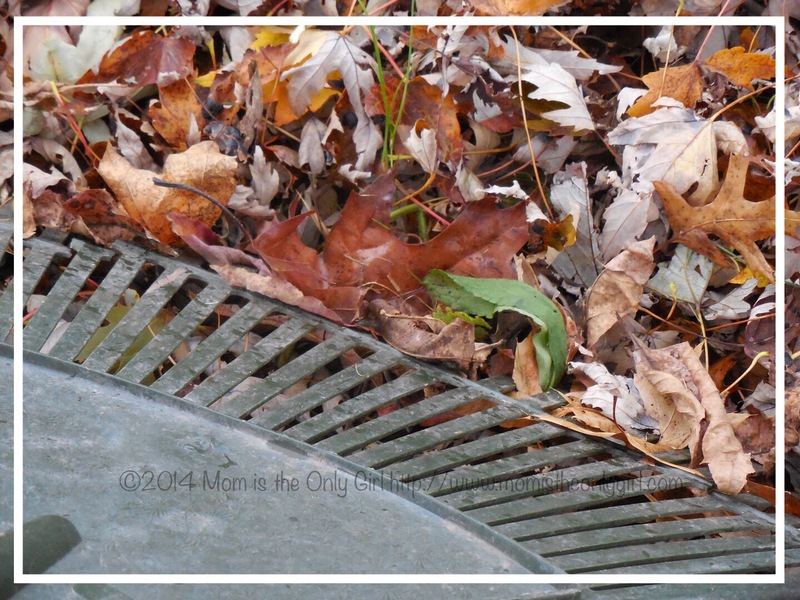 The family time spent raking leaves and jumping in them! Thanksgiving break is never a relaxing time for us. We celebrate Sweet Pea’s birthday, celebrate Thanksgiving twice (once with each family) then celebrate my niece’s birthday. Then we are soooooo ready to relax into the meaning of Christmas and the Christmas season. Seriously, though, Thanksgiving has always been special to me, but six years ago it took on an entirely different kind of special when we brought Sweet Pea home from the hospital on Thanksgiving day. I love seeing life through my children’s eyes and this year’s birthday was a little milestone for Sweet Pea. He turned six, and to him that meant he could finally have that LEGO train he wanted – because, after all it was for ages 6+ so he wouldn’t have been able to play with it before then! Don’t you love how their minds work? 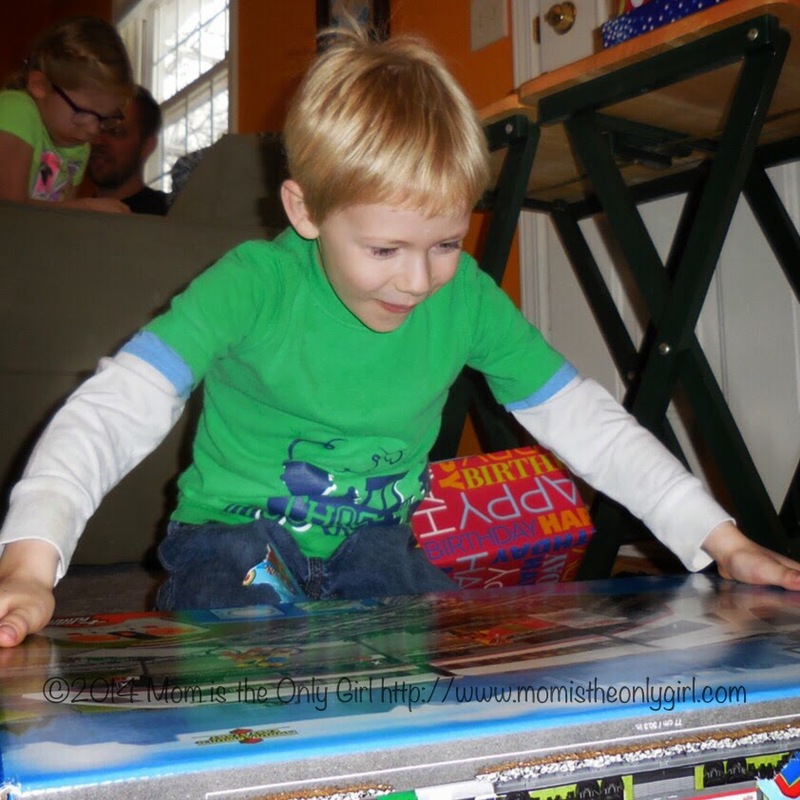 The joy of opening that one gift you were so desiring! With all that excitement behind us I can rest and think about the special moments we had this past week with family. I’m going to spend some time thinking again on January 1st. Not about the resolutions I will make or what the year will hold for me, but about the memories made in the Christmas season throughout December. The peacefulness of fallen leaves…introducing the colors of Christmas. Bright fall colors remind me that although the white of winter is coming, new life will follow. May we all take time to rest in the thought of memories we will cherish when this Christmas season has faded into the New Year. I encourage you to think about how you want to remember the month of December and act on it! *This post contains affiliate links, where, at no additional cost to you, I may receive compensation for your clicking on a link. 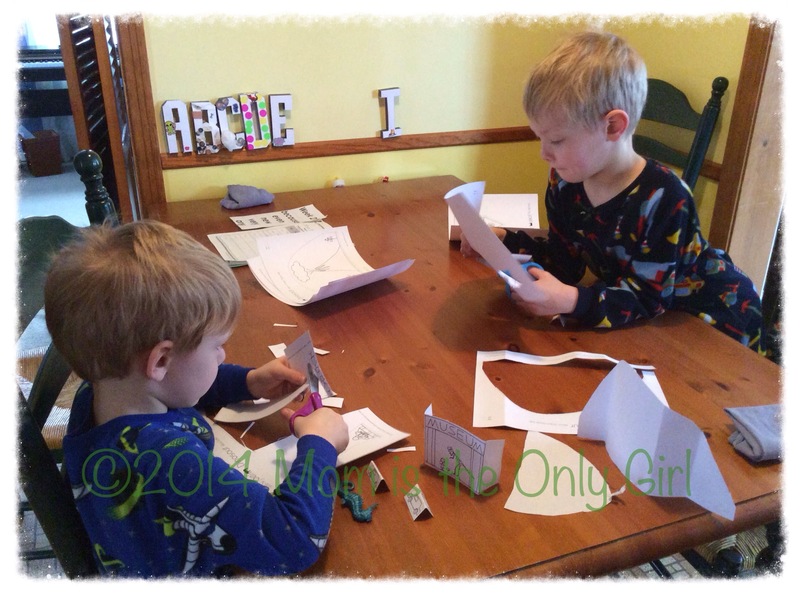 I remember a few years ago there was a blog hop of sorts that included doing a craft after reading a book with your child. Maybe it’s still going on? The craft would be somehow related to a character in the book, or go along with the theme of it. I think I tried this a few times with my boys, but they were never really excited about it, which is probably why I cannot remember what the linky is called. Help me if you know it, I can’t for the life of me figure out what to search for to find it! Fast forward to a week ago. 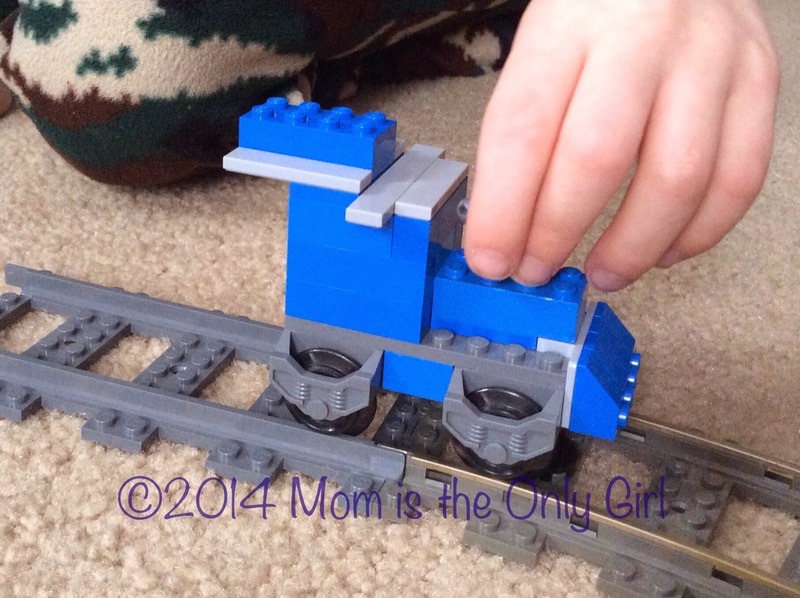 Five year old Sweet Pea and I read the book The Little Engine That Could by Watty Piper. Then he wanted to watch the movie, too. Did you know there was a movie? We found it on Netflix. So cute! Reading books and following it up with crafts is great, (really, because I would love to do a book-based craft with him) but for someone who doesn’t like crafts, building story characters with LEGOs is a great alternative! 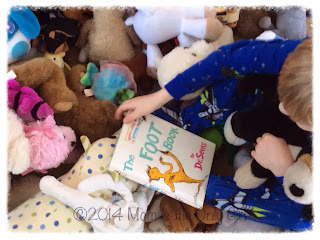 I would really love to see what your little ones create with LEGOs after reading a book! Please share if you do this at home! *Mom is the Only Girl participates in the Amazon Services LLC Associates Program, an affiliate advertising program designed to provide a means for sites to earn advertising fees by advertising and linking to amazon.com. By clicking on a link and making a purchase, at no additional cost to you, I may or may not be compensated for your purchase. 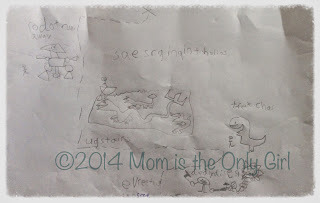 Seven year old Cutie Pie has been working on drawing a scavenger hunt map for Hubby, Sweet Pea and himself for a couple of days. 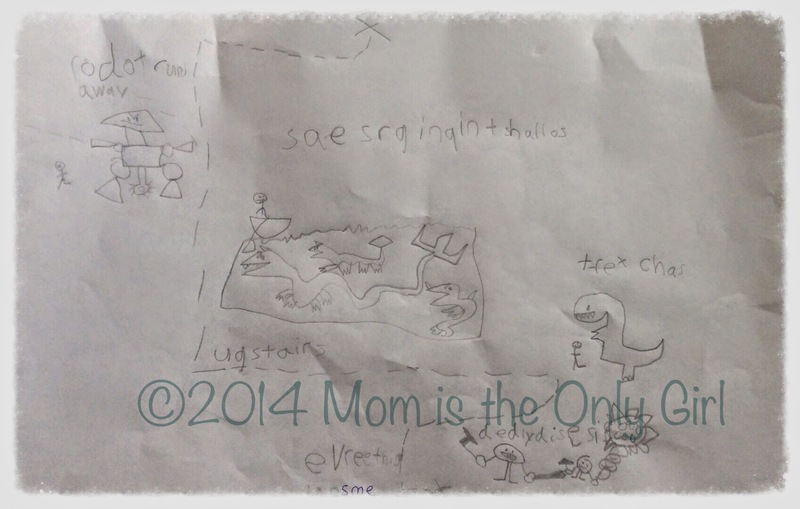 It’s quite detailed with obstacles to avoid (like a T-Rex chase in his bedroom) but no real house-landmarks. He amazes me with his creativity when he comes up with these things! Even though his map doesn’t include things like chairs and corners, the guys can clearly tell where they are supposed to go because of the visual cues (sometimes words) he placed on it. Of course, when pretending to go from spot to spot in a boat you never know when a colossal squid will get hold of it and keep you from finding the next clue and ultimately the treasure! Great fun practice writing and drawing. 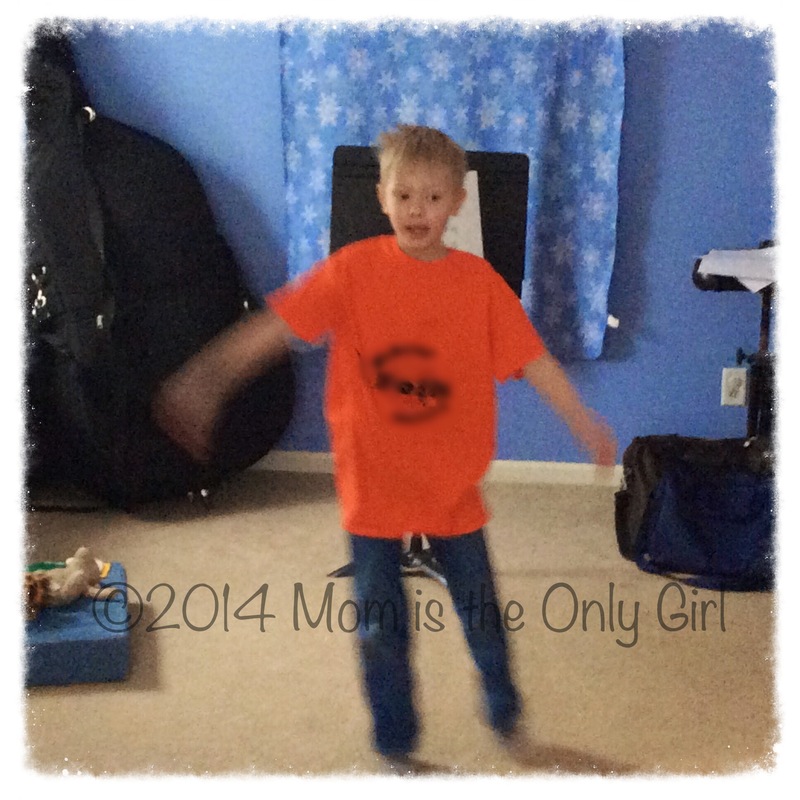 His spelling is still phonetical, but he’s working on it! I love watching him progress educationally! This has proved to be a great way to Encourage Writing! 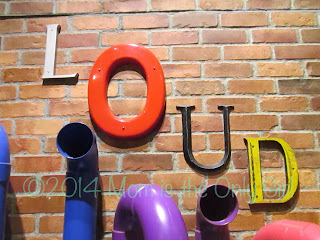 This is also a good challenge for when we need to keep the boys occupied for a few minutes…we call out a word and they have to come up with the opposite, or we sneakily ask them to call out the first word that comes to mind when we say a word. That’s always interesting! This idea sort of piggybacks on the similar or different ‘game’ we played the other day. I’m not sure why, but it seems our boys have fun with thinking games…. 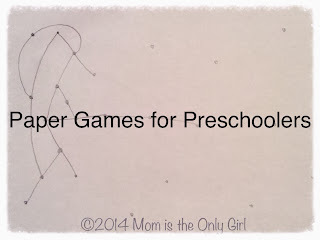 What kind of games do your kids like? Right now I’m listening to them talking about how exercise is good for your body and am watching them ‘exercising’. And just like that they are on to being Luke Skywalker and some unnamed person on the Millenium Falcon. The way these boys play the coordination ability required for each activity is definitely up there! We had two snow days this past week. The first we expected as a blizzard made it’s way through western New York State. The second day was unexpected, due to the storm not racing through our area quite as soon as anticipated, delaying when the roads could be cleared safely for buses filled with children. Hubby and I tried to keep the kiddos from going stir-crazy on the second (and bitterly cold) day by providing some art materials. I had also come across a dinosaur song on Made by Joel and played it for Cutie Pie, who was completely intrigued by the way Joel illustrated the song continuously on one long piece of paper. First, Cutie Pie wanted to make the paper pieces from Joel’s website for the song and got busy with Sweet Pea cutting them out almost immediately after he saw them. As soon as he finished that, though, he was on to trying to draw what Joel did, the same way he did! 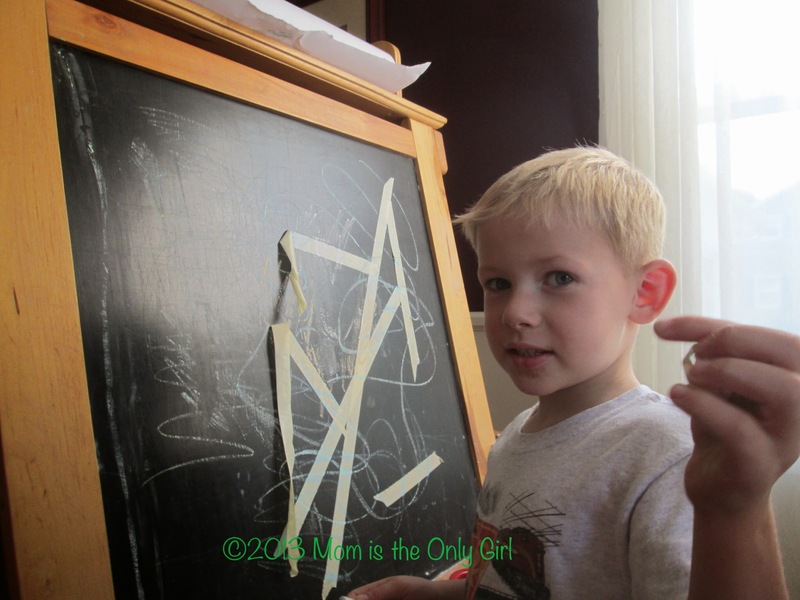 I love that Cutie Pie was so inspired to try drawing a little more out of the box than he is used to! I was also pretty shocked that he drew what Joel drew for the song, but in miniature and with only watching the video once! You’ve really gotta check out Made by Joel for some neat paper-based play ideas that you can print and play with! We made playdough! Conditioner and corn starch playdough to be exact. I can’t say I’m crazy about this dough like so many other mom bloggers, but Sweet Pea liked it because it was soft and silky. At kindergarten registration we learned about a few ways to make our kids’ fingers stronger to hold that pencil through fine motor play in a group meeting with the school occupational therapist. 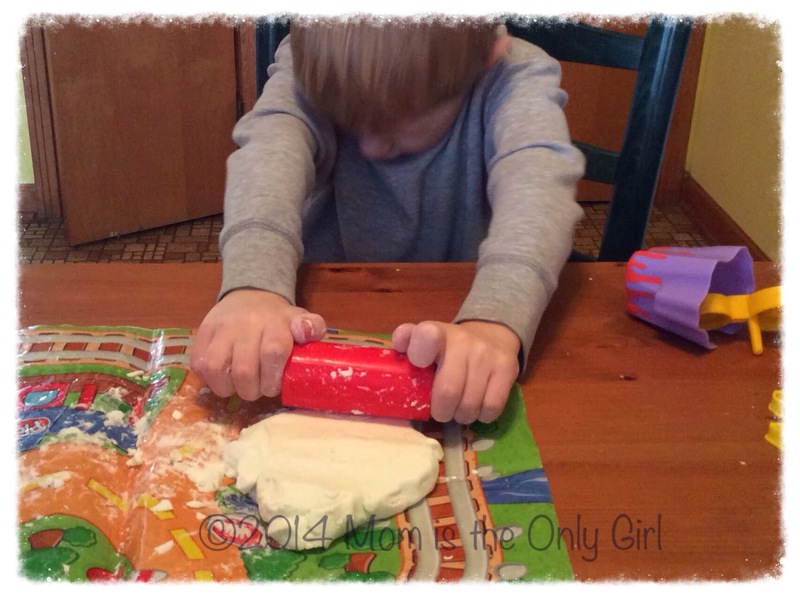 One way was putting beads in playdough and having the kiddos manipulate the playdough to ‘rescue’ the beads. I had planned on doing this with our playdough, but after it was made realized it wasn’t ‘dough-y’ enough to make it really fun. It also wasn’t the best for rolling into snakes to shape into letters. 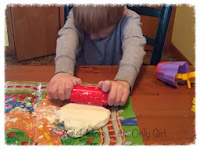 I am planning on trying these with him when we get out our other homemade playdough next time we get it out! Playdough alone is a great fine motor activity to build up those little fingers for writing and maintaining a good pencil grip. Have you gone the extra step and home and put objects in playdough for your kiddos to manipulate? What objects have you used? 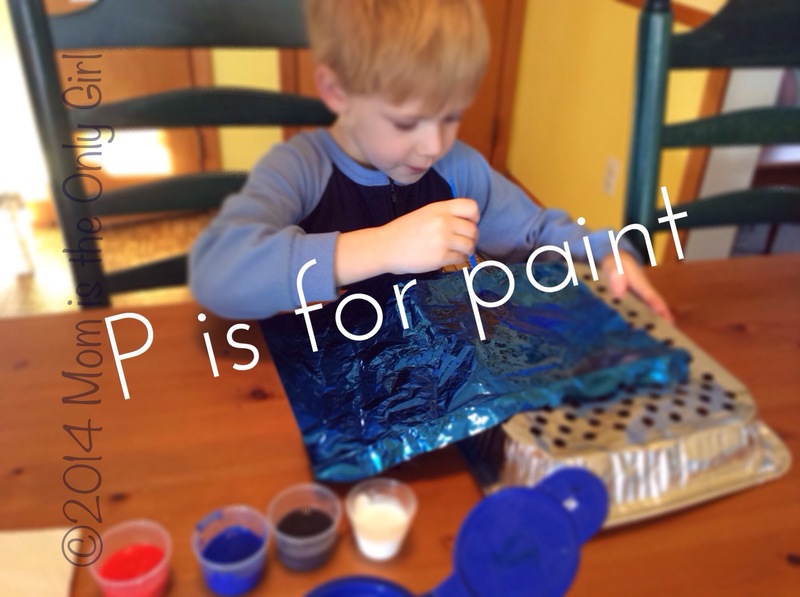 Letter P week has been so much fun and so colorful! We’ve been painting! We splatter painted, painted with big brush strokes, painted lots of polka dots, painted more snow, and even painted cookies! I think Sweet Pea’s favorite part of painting is exploring different things to paint on. He really liked painting on some shiny blue paper that was stuffed in a gift bag with a present. He loved the way the brush felt as he brushed it across the paper. Unfortunately, he didn’t like the way the paint crumbled off it as it dried. 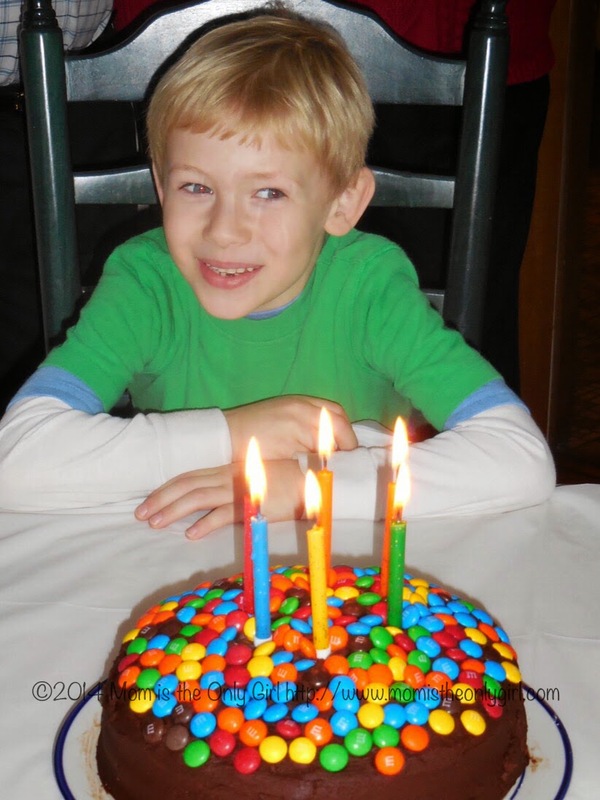 And he always has fun mixing all of the colors – like a huge science experiment! 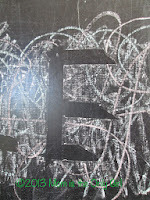 Sweet Pea did paint a letter P, but then had lots of fun covering it up with tons of paint (which turned brownish black)! 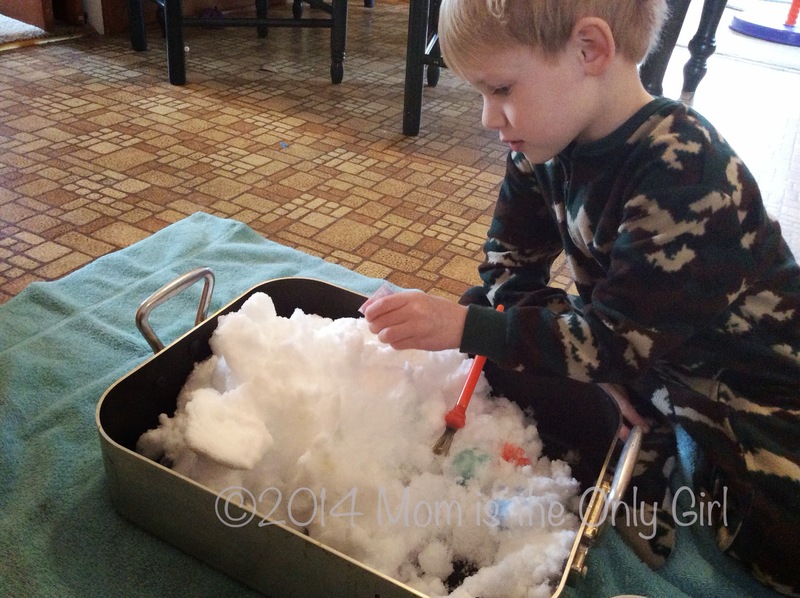 It was a very messy process, but one that he thoroughly enjoyed! 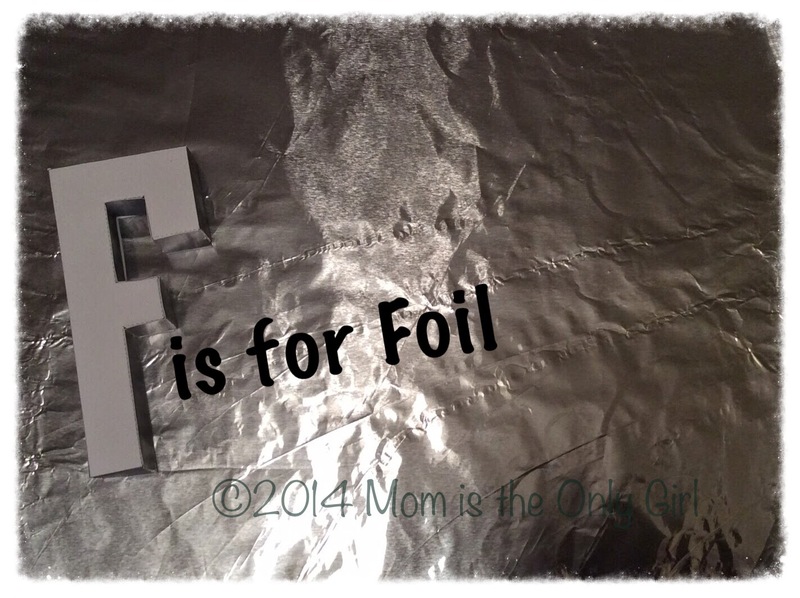 I’ll be sharing more letter P fun throughout the week! Some days they drive me crazy with their hyper-ness. Some days they make my heart weep. Some days they argue and fight. Some days they are the best of friends. They will always be brothers. They will always be my boys. Dots and Squares and Sprouts are two games in my ‘waiting time’ arsenal (at least, when I have access to paper and a pencil.) What are some of yours? 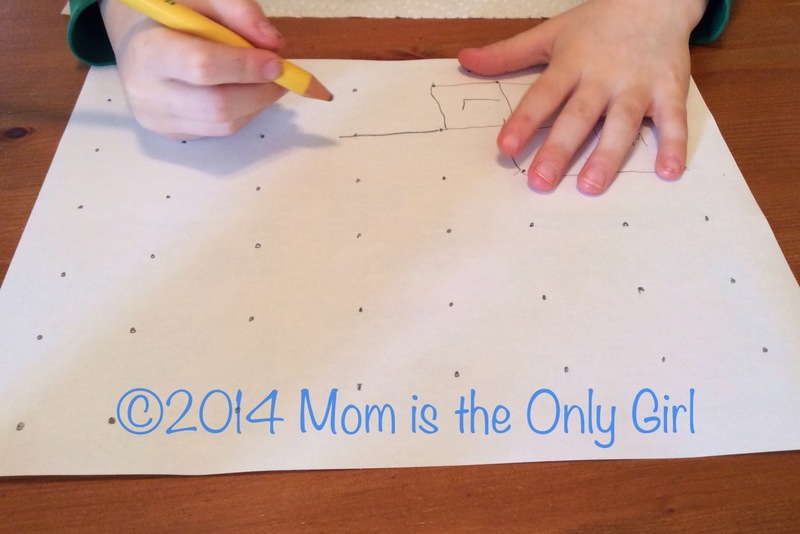 First, make dots all over a piece of paper. They don’t have to be in a neat grid like in Dots and Squares, just random. Take turns drawing lines between the dots, making a dot on the center of each line after it is drawn. The lines do not have to be straight, since there is no grid, and can curve and loop around, but they can’t cross another line. Each dot may have only three lines connecting to it. Remember, the lines don’t have to be straight. The last person to draw a line wins! 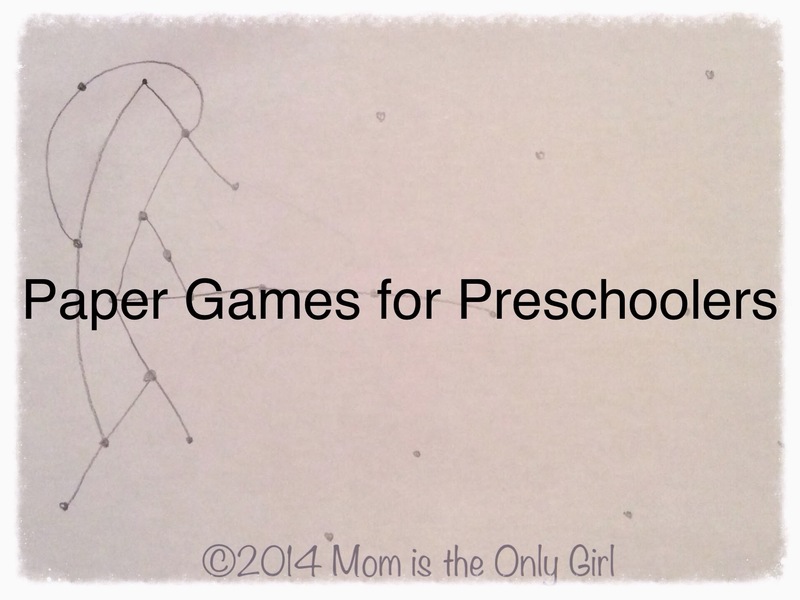 This paper and pencil game is a little more complex than Dots and Squares, so its probably better for a little bit older children, or preschoolers that can understand the instructions, since they’re a little more complex than just drawing a line. 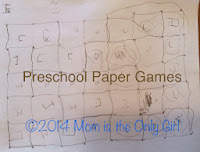 It still works on many of the same skills; coordination, pencil grip, processes. Recently I’ve pulled out both of these games for the kids and I while we had to wait for something. They were equally interested in both, but Sprouts did take a little more explaining as we were playing the game. So, what other paper games should I add to my arsenal? Any ideas? The other day 5 year old Sweet Pea was sitting with me at the table while I enjoyed my hot cocoa (he drank his rather quickly!) I grabbed a piece of paper that was on the table next to me and started making dots. I’m not sure why, but this game I played as a kid came into mind and I thought he’d like it! 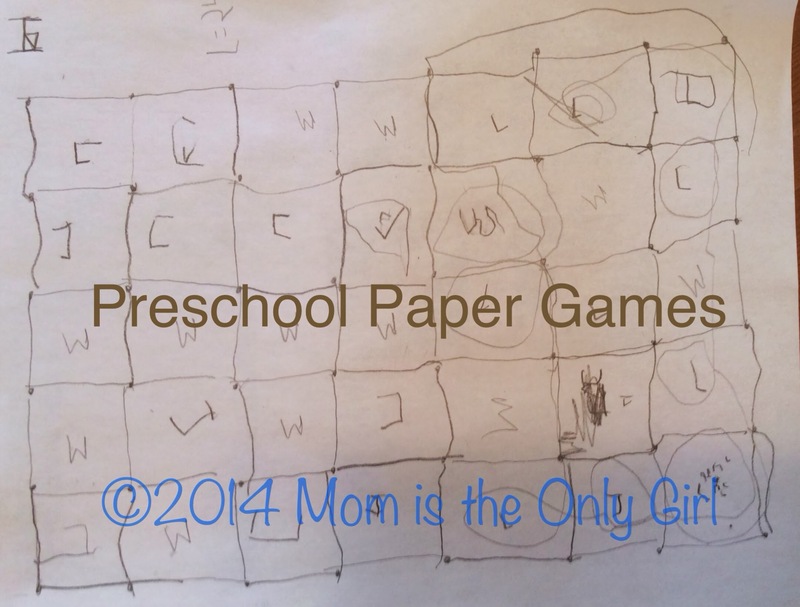 Here’s how you play Dots and squares, in case you never played or need a refresher. Make a grid of dots, more for older players, less for younger. Take turns drawing lines between dots. 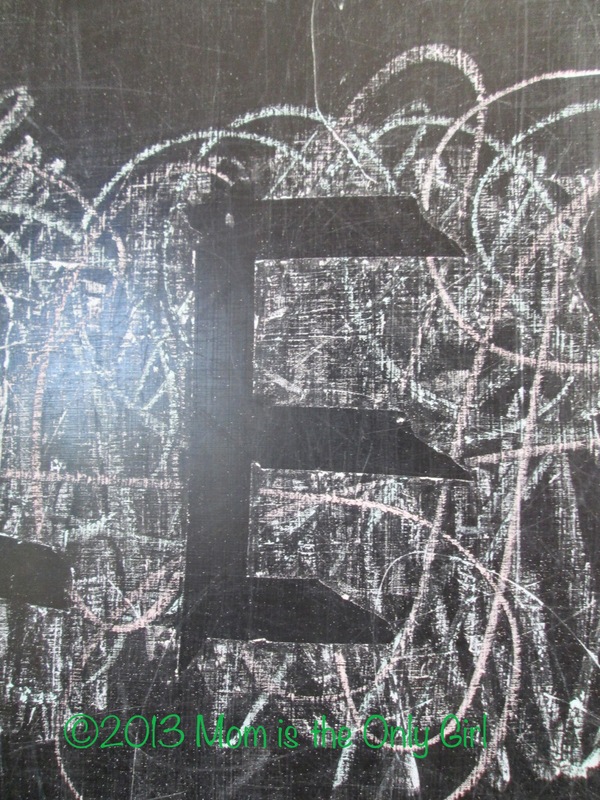 Write your initial inside each square you complete. After the last line is drawn, count your initials. The person with the most wins! I had tried playing this with Cutie Pie when he was 5 and he wasn’t very interested. 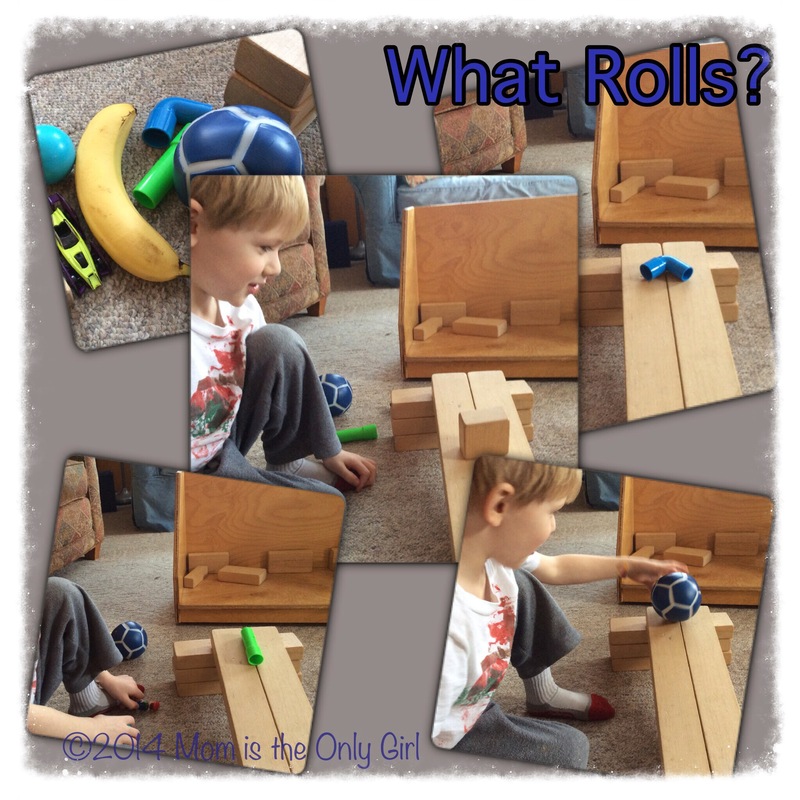 It all depends on the child, their interests and capabilities, but it is a great exercise in taking turns, coordination, fine motor skills, prescribing practice and processes! If you try this with your kiddos let me know what they thought! Remember the other day when I posted about painting snow? I had totally forgotten that I typed everything 5 year old Sweet Pea was saying as he played. He really could’ve gotten along without me even sitting there, just talking along to himself (as you will read) so I didn’t feel guilty typing, especially because it was something he wanted to play with by himself and didn’t even want me to stick around! For me snow mixing and butter mixing and color mixing, and juice mixing, those are the only mixings I know of. It feels like foam but it’s colder. Look at the snow after I put in the water! I wonder what will happen if we mix it with beaters. I like just putting little hunks of snow in cups of water so you can pretend its….when you put water in the snow it makes it less snow, I’m going to keep adding some water. Me: What will happen if you add water? The whole thing is going to freeze. 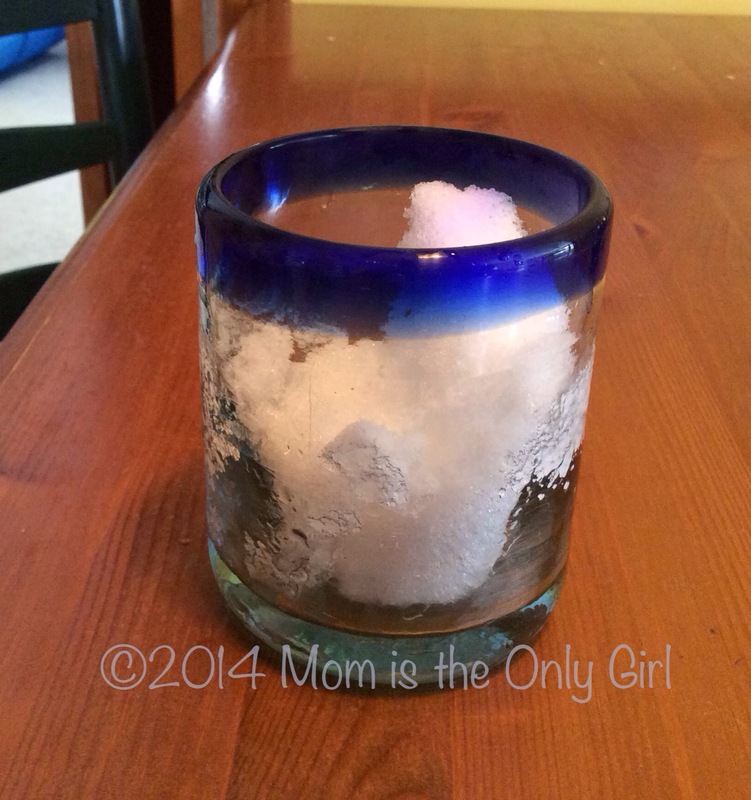 Why are the ice cubes sticking to the ice? Hmm, maybe we should look that up! I think we will be doing some more little experiments with ice! Some days he just doesn’t go for whatever I set out on the table to try to interest him in a little more ‘formal’ learning. Other days he does. We’ll see! Now, honestly…do you have constant talking in your house like this, or is it just here? I’m feeling a little guilty today. See, I have this knee ‘condition’ for which I should work out regularly. I’ve also had this little cold for about a week as well as this numb headache since last night. Needless to say instead of working out today while Sweet Pea was in preschool (at the Y no less!) I skipped out and came home. To be honest, it’s not just those things that made me just come home. Some days when Sweet Pea is at preschool and I have those precious couple of hours to care for me, I feel lonely. I mean, I’m in the gym working out, having time to take care of me, getting my body back (even though it’s been 5 years I still have that pudge) and am in the midst of other moms with the same desires to feel better, feel healthy…I still feel lonely. 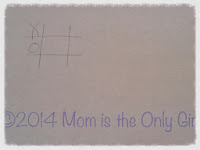 I don’t ‘connect’ with those other moms. I’m just in the same room with them. Maybe say a polite ‘hello’, but don’t truly interact with them. It’s not that we don’t have anything in common. Maybe we do. It’s not that I feel less than them even though their bodies may be more in shape than mine, I know our goals are probably the same since we’re in the same place doing basically the same thing. Are you lonely, too? Whether it be at the gym or going to a mom’s club type of meeting, or a ladies’ church event…do you find yourself wondering if it will be easier to make friends when your kids are in the upper grades, or out of the house even though you thought it would be much easier to make friends once you had kids? 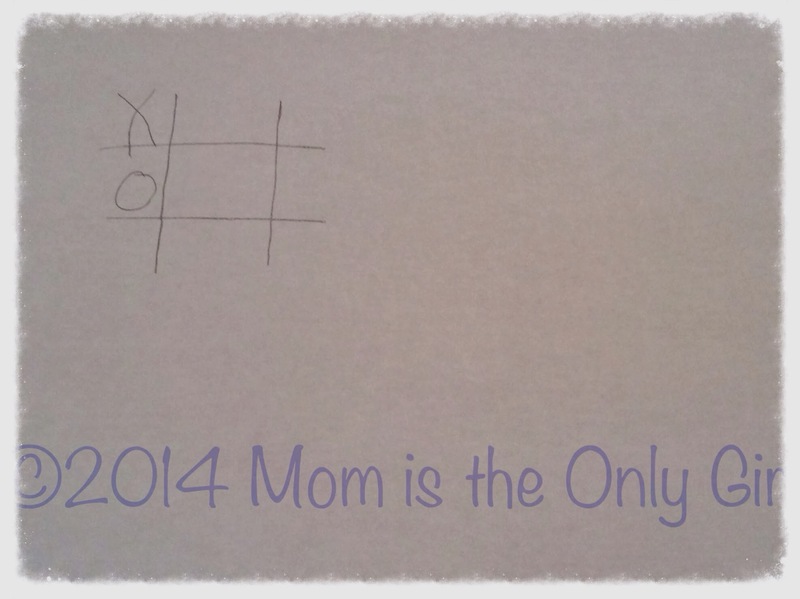 I think a lot of moms are lonely on some level. Whether they have little babies, young kids, teens, college kids, are empty nesters. 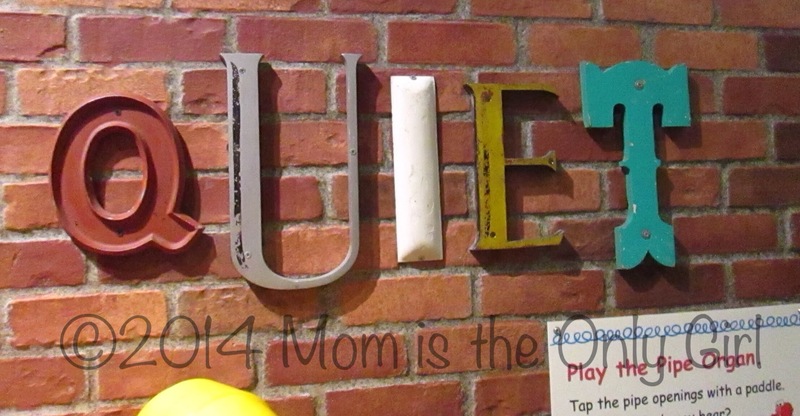 I think we all have expectations of what our ‘community’ of moms will look like, how we will connect with others, but it is all so different than when we were kids and could simply play together or maybe share a secret. I just was trying to get this headache to disappear and was just about to collect my mind and return to the Y to get my Sweet Pea, but thought I’d check facebook first, since that’s my usual source for adult communication throughout the day, and came across something that made me go to Finding Joy. I quickly came to this page about how “Motherhood isn’t meant to be lonely”. It spoke to me so much that I just had to sit down and type this out. 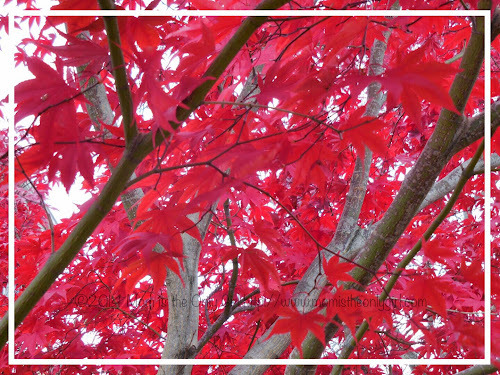 If you can relate to what I’ve shared today, please consider checking out Finding Joy. Let me know I’m not alone. These bitterly cold mornings keep us indoors while waiting for the bus. 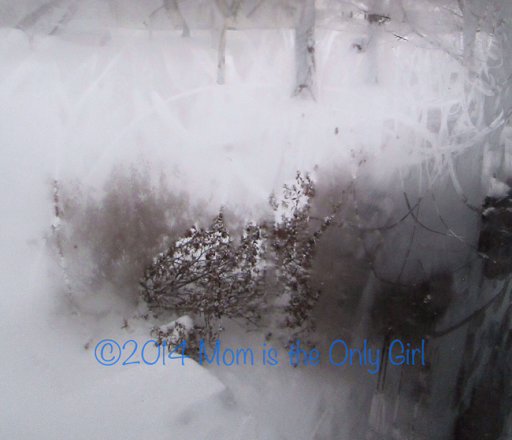 Once that door opens and Cutie Pie leaves, Sweet Pea and I spend a few minutes drawing on the frost-covered door before shutting the heavy door and retreating to the warmth. I especially enjoy this time, though, when he’s using his imagination, coming up with his own ideas of what to draw. It’s like my little eye into his ideas for the day. Sweet Pea seems to enjoy feeling the cold with his fingers then scraping some frost, or drawing on the fogged surface. Most days he draws pictures for me, or makes handprints, but some days he likes to meet my challenges. Some mornings I challenge him to write his name, or a letter he is learning in school. Other times he draws objects he’d like to build with LEGOs later in the day. 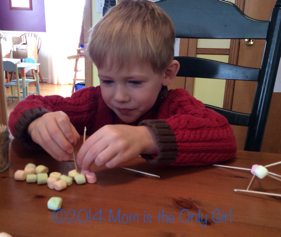 I posted earlier this week about Sweet Pea building with marshmallows and toothpicks. I thought I’d build on that a bit (get it) and share what else he likes to do with them! Sweet Pea is big into counting anything and everything right now. We practice counting with them! 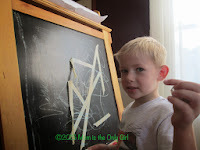 Fine motor practice at this age is great, as 5 year olds are learning to print their names and draw pictures. 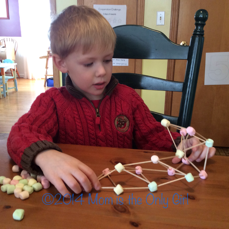 Picking a marshmallow up with toothpicks is great fine motor and coordination work and is fun, too! Sweet Pea likes to pick them up one at a time with the point of a toothpick (the dull-ended ones work for this, too). He likes to see how many he can fit on a toothpick. Once I challenged him to see if he could pick one up with two toothpicks. He liked that! Sometimes we get the colored mini marshmallows. That’s always fun because he likes sorting by color, and you can make patterns with those, too! Now, I don’t want you to think I let Sweet Pea have marshmallows all the time. This is an every once in a while treat. I just thought I’d share the fun (educational) things we do with them, rather than just eat them! I had given my boys a challenge to build something new out of blocks. 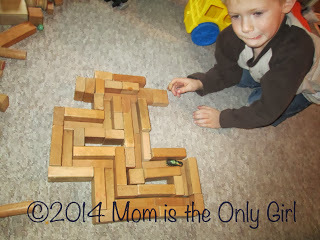 Offer your kids this challenge…what did they build with blocks? !